Saturday marked the 239th birthday for the great U.S of A. On this great day, many celebrated with cookouts, beer and fireworks. Spending time with good friends and family, while waving showcasing our patriotism is the only way I can imagine celebrating our independence day. Traditionally I’ve spent my 4th of July celebrating with lawn games, beach, boats, cook-outs, and beer, lots and lots of beer. However, this year my friends and I decided to switch it up a little by attending the AQUA EDM show at Fort Adams in Newport, Rhode Island. Live music, a beer garden, water holograms and a killer firework show made for a memorable night to celebrate the stars and stripes. Fort AQUA was an awesome experience that I would recommend to anyone looking to have a good time. I’ve been to my fair share of music shows and festivals, and I must say this one was one of the most unique. It definitely ranks at the top for originality. There are a few things that really separate this event from other music shows. The first distinction being their use of the ‘stage’. Typical venues will have a stage filled with giant screens for a graphic/video to be displayed on. Fort AQUA provides a completely original stage made of water to create water holograms which float around the artist. This is done by layering sheets of water with fountains and mist, in combination with lights, lasers and projections. The results are mind blowing and a real game changer. The fancy light show at a typical music festival is always nice, but what really differentiates the AQUA experience is their alignment with WATERisLIFE (WiL). WiL is an organization dedicated to providing clean drinking water, sanitation and hygiene programs to villages and schools in desperate need. AQUA’s partnership with WiL is truly amazing, as every ticket sold brings 36.5 days of clean water to a person in a Ghanian village. To provide further means for donations, attendees could buy a rubber AQUA bracelet for $1.00 to donate further to the cause. We should all support the mission to stop the water crisis and save the world. AQUA is doing it right and being a leader in the efforts to make a change. They provide a fun and entertaining event for all ages to enjoy, while donating to an outstanding cause. Often times we as Americans take water for granted. The efforts made by AQUA and WiL vastly highlight the fact that water really is life. 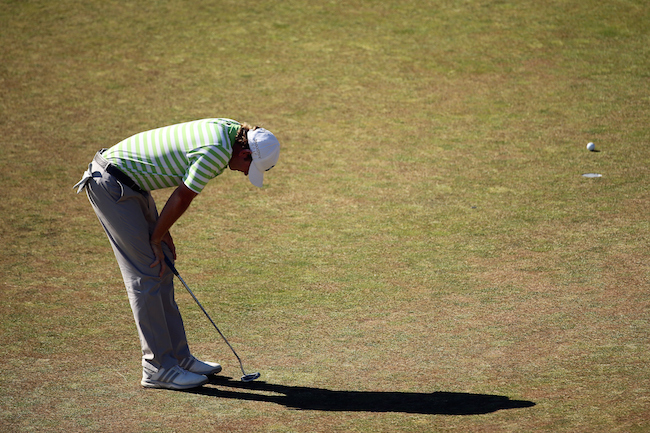 The U.S Open – Is Golden Brown the Future for Golf? Two weekends ago, Chambers Bay Golf Course in Washington, Oregon held the United States Golf Association (USGA) Men’s U.S Open. For those who missed it, the hot topic of the weekend wasn’t about the exceptional play of golf, but instead was about the ‘poor’ conditions of the course. While watching the tournament at the bar with my friends, I immediately noticed the golden-brown color of the grass, which greatly contrasted the luscious forest-green we saw at the Master’s in Augusta, Georgia. Initially I criticized the USGA along with my friends, questioning whether these conditions are acceptable for a professional grade tournament. I was not alone in my remarks on the poor conditions of the course, as many players openly clamored about how hard it was to sink their putts. Multiple players jokingly tweeted that the greens were like putting on broccoli or cauliflower. After countless 3 putts and shocking ball bounces, Jordan Speith rose up and took it all as winner of the Men’s U.S Open. Congrats to Jordan Speith on his Win! Let’s dive into the logistics of the Chambers Bay golf course and why we saw this infamous golden-brown grass. The brownish looking grass used for this course is called ‘Fescue’, a slower growing grass that requires less water and is resistant to drought. Fescue might not be the most attractive grass out there, but its environmental benefits greatly outweigh its ugly brownish hue. Chambers Bay was designed to specifically combat the ‘Great Drought-Depression’ that the northwest has been seeing for the last few years. The course uses reclaimed wastewater for irrigation and sewage from a nearby treatment plant fertilization. These efforts earned the course a designation as an Audubon International Silver Signature Sanctuary. Now knowing the benefits of Fescue grass, do you think the criticisms Chambers Bay and the USGA received is justified? It’s hard to criticize a course for taking an initiative to improve the poor reputation with the golf industry and its overuse of water. You can’t blame the USGA for aligning themselves with a course like Chambers Bay who has made great efforts to improve their environmental footprint. The greens may have been tough, but as Rory McIlroy said, ‘It’s all mental; par is what you make it’. Everyone is playing on the same greens and these tournaments are meant to be difficult for a reason. Adjusting to the circumstances is part being a professional and why these players are paid the big bucks. If you ask my opinion, I would commend the USGA for choosing a course like Chambers Bay to host the Men’s U.S Open. It shows a great commitment towards changing society’s mindset and working towards a better planet. Our planet is delicate and the record low water levels in the Northwest are a testament to the Earth’s fragile state. Leading by example is the only way we are going to change anything. What we need to do is change mindsets. In Europe, Fescue grass is very popular for golf courses where players see it as the norm. For areas that are experiencing the 15 year ‘mega-drought’ it would be a good idea to adopt the same mentality as our European neighbors. But then again, what do I know about professional golf? I’m just a fan who’s happy playing bogey golf while attempting to save the planet.